With all the PiBoIdMo and MeeGenius hubbub, I never got around to my November book review. So, I'm making up for it with an extra special, spectacular, double-sized, end-of-year posting. Let's go! Last week, my family won a gift card to Books Inc. from a PTA drawing. Hooray for us. So, the whole crew went this weekend with the idea that everyone gets to pick ONE book. Nate immediately chose a Lego Harry Potter sticker book. Not quite what I was shooting for, but he's happy. Sophie was a little tougher. We searched and searched. At first it HAD to be a horse book, but none were to be found. Then, she honed in on the spine of a book she recognized. Pinkalicious. Great! Done! But then I noticed another book and said, "Sophie, you like wearing purple and look! Purplicious!" Then I asked which one she wanted. Of course, the answer was "Both." Sophie's a tough customer. At age 4.5, she knows what she wants. We debated in that bookstore on how everyone was just picking ONE book, but she wasn't budging. Then, she pulled out the big guns. 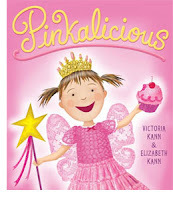 "So-and-so in my preschool class has ALL the Pinkalicious books. She has LOTS of them." Really? We've already reached the peer pressure stage before Kindergarten? But we're not talking about dolls or makeup or shoes here. My little girl is fighting for BOOKS. How could I refuse? I forfeited my pick and Sophie left the store quietly. Needless to say, these books by a sister team are totally fun. With the bulk of our picture book collection skewing "boyish", it's nice to add a splash of pink and purple to the mix. I had no idea what a hit In Front of My House would be when I brought it home from the library. Nate absolutely loves it. 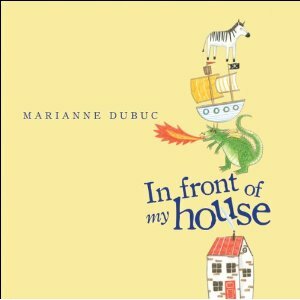 Deceptively simple, the story takes the reader on a journey that starts, naturally, in front of a house, but quickly takes off to unexpected stops along the way. Each page turn is a colored pencil drawing that is somehow connected to the preceding and following pages. For example: Beyond the forest... [page turn] a mountain. At the very top of the mountain... [page turn] a cave. At the back of the cave... [page turn] the dark. In the dark... [page turn] a growl. 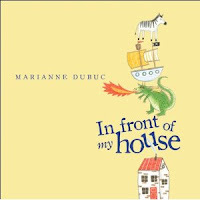 But this is not your standard picture book layout. It goes on like this for 118 pages! And every one is perfectly fun. The best part is, Nate insists on reading it to me now. That's when a book becomes more than a book. It becomes a great memory. 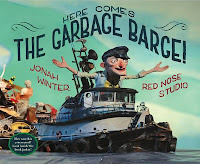 HERE COMES THE GARBAGE BARGE! You just have to see this book to believe it. It's based on the actual 1987 events of a garbage barge that drifted up and down the east coast all the way to Mexico and back in search of a port to dump 3,168 tons of Islip, New York's trash. That's enough to catch your attention, right? But what makes this amazing book really stand out is that all the illustrations are actually photographs of miniature sculptures made out of--you guessed it--garbage. The look and atmosphere are so unique and entrancing with an edge of creepiness and mystery. Utilizing a grimy color palette, dramatic lighting and depth of field, it feels little like a Tim Burton stop-motion film. And if you're wondering how Chris Sickels of Red Nose Studio did it, you're in luck. Inside the dust jacket is a behind-the-scenes look into how he created the mesmerizing imagery. In spite of the smelly subject matter, Here Comes the Garbage Barge! is quite refreshing! I loved this book when I found it at the bookstore. I marveled at its simplicity and beautiful design. I chuckled at its cleverness. 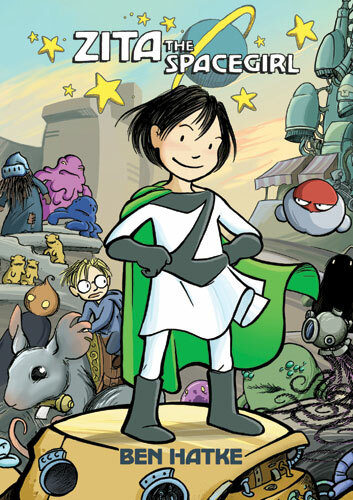 I noticed the praise its been getting online, making many best books of 2011 lists. I couldn't wait to get it home and read it to the kids. "This book is so funny!" I told them. "Come, sit down. Check this out." We read it. I got blank stares. Maybe I read it wrong. Maybe they just weren't in the mood. Or maybe I Want My Hat Back isn't that kind of book. The humor isn't "adult" per se, but there is a certain wink and nod kinda thing going on. Granted, my kids mostly go for slapstick before deadpan jokes. But I'm not giving up! Maybe it's one of those books they'll have to warm up to. We'll try again. This book is too good to only read once. 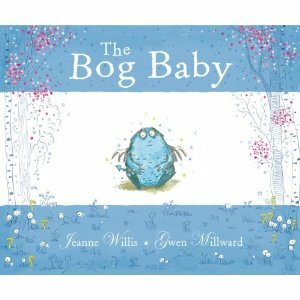 The Bog Baby is simply gorgeous in every way. There's a little bit of magic going on here, and it totally gives me the chills. The spindly, curling, detailed illustrations are a wonder to explore, and the cautionary tale of honesty and bringing wild creatures home gives the story a deep, important feeling. Two little girls discover a Bog Baby in the forest and carry him home. They keep him secret and enjoy playing with him. But, of course, the Bog Baby can't survive in a bucket eating cake crumbs. I brought this book home for a couple reasons. First, it's just an enchanting picture book. And second, because my children LOVE bringing Bog Babies home. For us, it's mostly snails, salamanders, ladybugs, rolly pollies, and crabs. We've had a few tears over the injustice of leaving crabs at the beach where they belong. And on several occasions I've snuck insects and tiny lizards back outside once the kids grow bored with them. I just can't let them die! 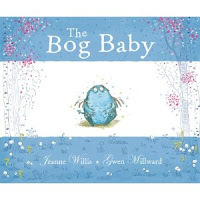 My kids are still just a little too young to understand that animals aren't toys, but hopefully, The Bog Baby can gently encourage them to love nature and treat it responsibly.